I want to use doxygen for my microcontroller projects with avr-gcc. Doxygen is working good as expected, but i have a problem with the variables. When i run doxygen only the volatile variables are listed correct, all other global variables are ignored. The variables in EEPROM are completely messed up, because in the overview only the first variable is listed and the rest is missing. In the detail view only EE_dummy is listed but with the comments of all EEPROM variables. I could not find out what is wrong or missing? Some time ago there was a similar question, that was not answered. 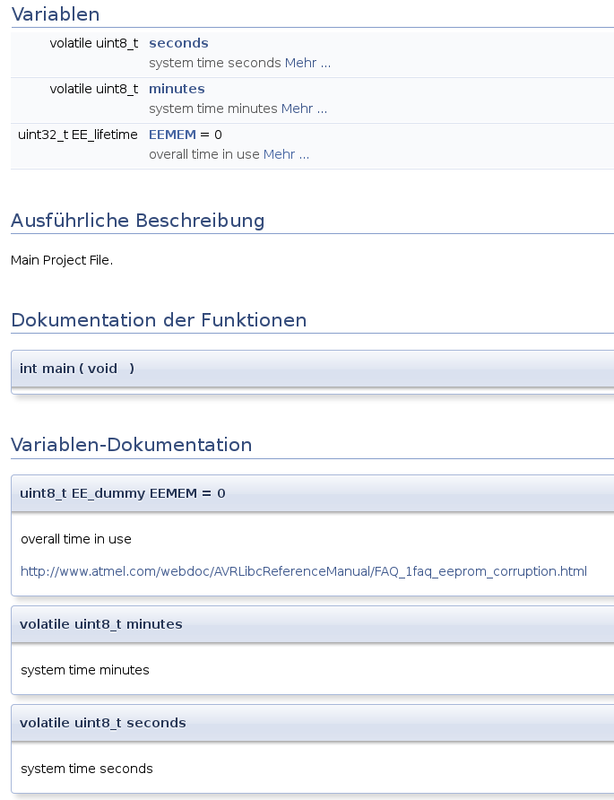 which produces the expected documentation for EE_lifetime. Not the answer you're looking for? Browse other questions tagged variables doxygen avr-gcc or ask your own question.